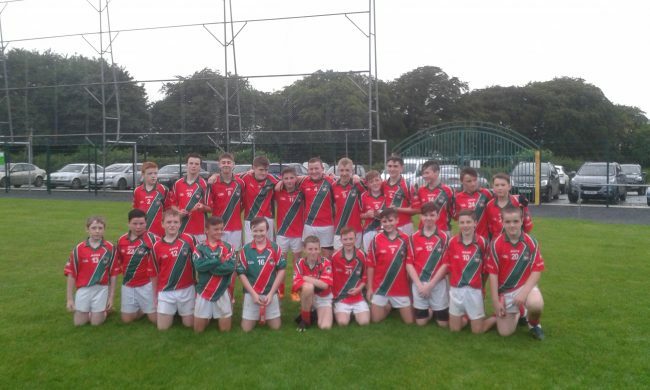 Saint Martins and Glenmore squared off in the quarter final or the u14 Chgampionship in Thomastown. Glenmore had first use of the strong wind and built up early lead Martins fought back well to lead at the break 3-2 to 1-7. With both sides striving manfully to gain the upper hand the lead changed often but St.Martins showed character to secure a win with a late goal. Well done to both sides on a fine contest. Final score 4-8 to 3-9. Saint Martins u14 hurlers made a good start in the u14 Roinn B Champoinship getting a win against Danesfort. Johns Park was the venue on a nice evening with Danesfort getting first use of the fresh breeze. St. Martins trailed after the first ten minutes but fought back well to lead at the break 2-10 to 1-4. 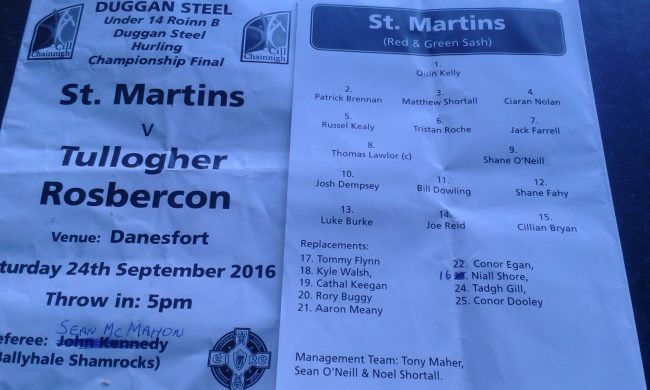 Wind assisted Martins kept up the pressure in the second half despite a late flourish from Danesfort to run out winners 4-20 – to 3-6. Selectors Noel Shorthall, Sean O Neill, Anthony Maher. St. Martins u 14 Hurlers took part in the regional Feile Tournament in Thomastown they were grouped with Glynn/Bartown (Wexford), St Finbarrs (Cork), Craobh Chiarain (Dublin). After some good hurling and wins against the Wexford and Dublin and a loss against the Cork lads, St. Martins finished as runners up. 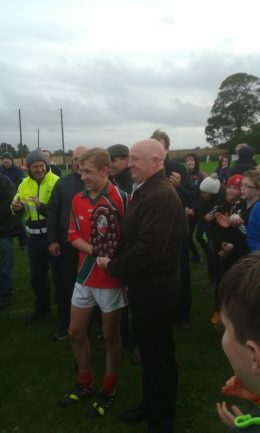 St.Finbarrs as group winners went on to win the final which was played in Clara. St Martins u14 hurlers made the long trip to Glenmore to take on the locals. Both sides were under strength but it still turned out to be a good contest under the conditions of rain wind and a heavy sliotar. St. Martins were ahead at the break 0-7 to 0-3. The second half finished with Glenmore pressing for a goal but it was Martins who advanced to make the League Final Roinn B. Result 0-11 to 1-6. Team Oisin Kelly, Patrick Brennan,Matthew Shortall, Ciaran Nolan,Russel Kealy, Bill Dowling, Jack Farrell, Shane O Neill, Thomas Lalor,Josh Dempsey,Joe Reid ,Cillian Bryan , Rory Buggy, Shane Fahy, Kyle Walsh, Niall Shore, Cathal, Keegan, Tommy Flynn , Conor Dooley, Aaron Meany, Clonor Egan, Tristan Roche (inj. )Luke Burke (inj.) full compliment of subs used. St Martins u14 Hurlers qualified for the semi-finals of the Roinn B League with a win over Kilmacow. Muckalee was the venue and on a lovely evening for the game both teams but on a lively and sporting display. Result 2-17 to 1-5. 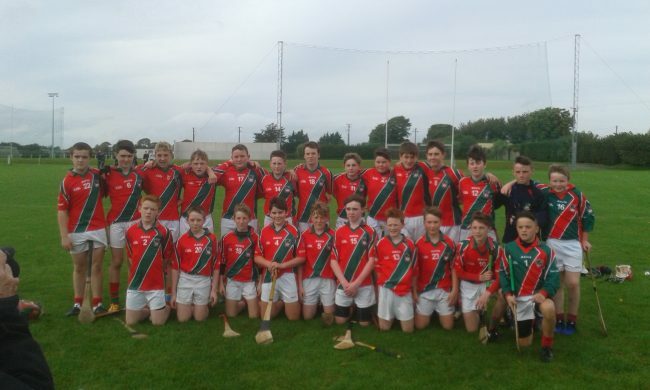 St. Martins u14 hurlers made the trip to Lisdowney to take on their hurlers in the League. Both sides produced a well contested opening half before Martins hit the front and finished strongly to take the points.Final score 5-17 to 0-1. Selectors Noel Shortall, Sean O Neill, Anthony Maher.